We all know water systems disinfect the water supply. And to ensure that the water remains disinfected, water systems add a chlorine residual so that the water remains safe during transit to homes, hospitals, businesses, and other locations. Source water travels through a public drinking water system to the main drinking water distribution system to the premise plumbing in your home before you use it in the shower or drink it. Premise plumbing includes the pipes, faucets, shower heads, and the hot water heater in your home. And it’s here where potential risks to public health may be lurking. Harmless microbes that present no health risks to occupants can grow in premise plumbing, but under just the right conditions, some rarely found harmful pathogens take the “opportunity” to grow and flourish in premise plumbing, feeding on and being protected by those harmless microbe colonies. These harmful microbes are referred to as “opportunistic pathogens”, which present little or no risk until they multiply in large numbers in “hiding places” like shower heads and the sediment that accumulates in hot water heaters. Those with compromised immune systems are at higher risk from these opportunistic pathogens. According to an August 2015 article in Environmental Health Perspectives, Legionella is one of several opportunistic premise plumbing pathogens that can persist and grow in household plumbing systems. But there are some simple steps that can be taken to keep the water fresh in your house and reduce your risk from these opportunistic pathogens…many of which we probably do without even thinking about it! The early morning “flush”. Most of us use a lot of water early in the morning. The line leading from the street to your house may contain as little as 3 gallons (50 feet of ¾ inch line), and one toilet flush can take care of a good deal of that older water sitting around overnight in the premise plumbing. Water those plants. Pulling the first pint or so of water from your kitchen faucet will clear it of that stagnant water sitting overnight there. Taking a morning shower will likewise move a lot of water through the home premise plumbing. But there’s still the hot water heater and hot water lines…and what can we do there? Most manufacturers recommend flushing out the hot water heater every one to three years. This is accomplished by putting a hose on the spigot at the bottom of the tank and running water into a drain or outside the house (follow the manufacturer’s recommendation). Don’t feel alone if you have never done this…most people never read (or see) that instruction bulletin that comes with the hot water heater. And don’t be surprised if you see discolored water coming out of the hot water heater when you flush it…this is typical. As the water heats up, some dissolved material in the water will settle out in the bottom of the tank. 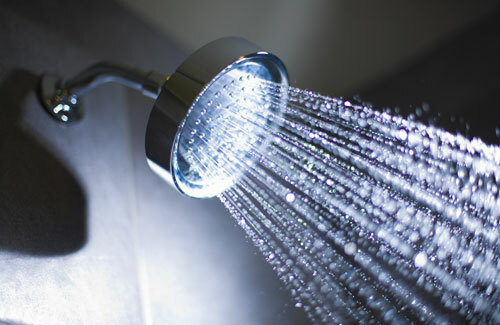 When taking a shower, usually some of that water comes from the hot water heater and has been sitting in that shower head since the last shower. Thus, it’s never a good idea to drink from that shower head, or let the water run into your nasal cavities. Don’t use water from the hot water spigot to prepare drinks for consumption … particularly baby formula. The same goes for neti pots…never use any water from the hot water spigot to fill your neti pot. These simple tips will go a long way to reducing your risks from opportunistic pathogens that may be in your premise plumbing as well as risks posed by other contaminants like lead and copper, which can be more significant. Overall, risks from premise plumbing are rather small, and the chlorine residual in your water supply greatly reduces the risks from opportunistic pathogens. The water entering your house is highly regulated, and taking a shower, drinking water from the cold water tap, and other typical domestic uses of water present very little risk of disease. Regulators and researchers are looking for additional ways to reduce these risks.